William Hale Thompson (1869 - 1944) served as mayor of Chicago from 1915 to 1923 and again from 1927 to 1931. 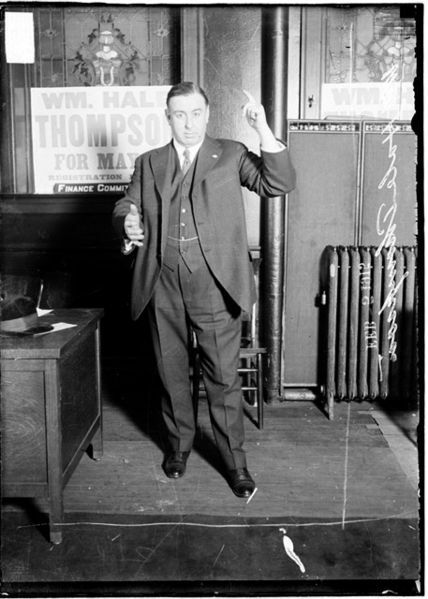 Thompson was the last Republican to be elected mayor of Chicago. Known as "Big Bill" his administration became notorious for corruption. To appeal to Irish voters, Thompson promised that if King George of England ever dared set foot in Chicago he would "punch him in the snout." Thompson was very popular among black voters. During the 1927 campaign, Thompson brought two rats out in cages on a stage and proceeded to debate each rat which represented his opponents. One of the rats was supposed to represent Fred Lundin whom Clarence Darrow helped defend from corruption charges. Thompson was angry at Lundin for backing his opponent.